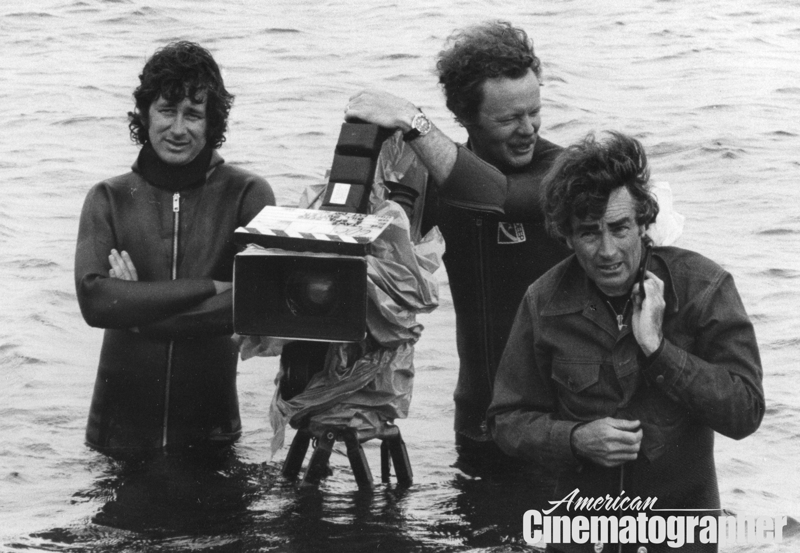 Director Steven Spielberg, operator Michael Chapman and cinematographer Bill Butler, ASC — braving the waves during the lengthy production of Jaws (1975). 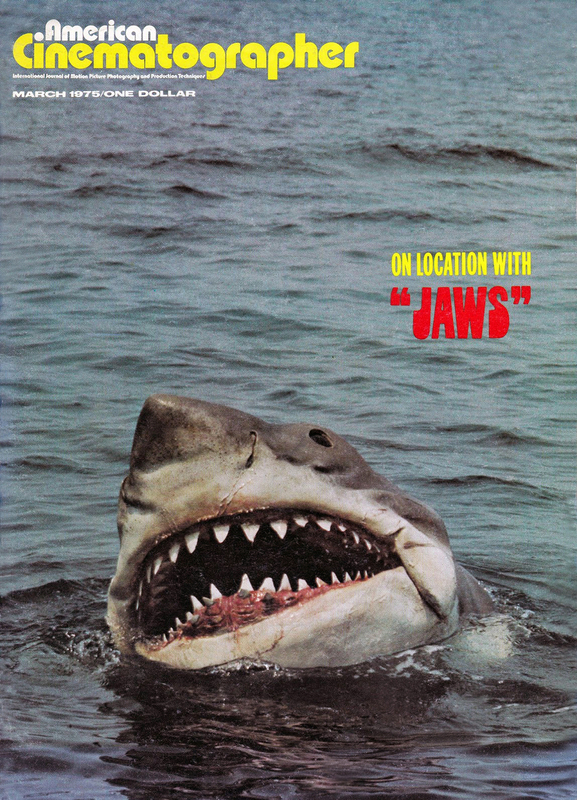 AC's cover story on Jaws appeared in March of 1975. 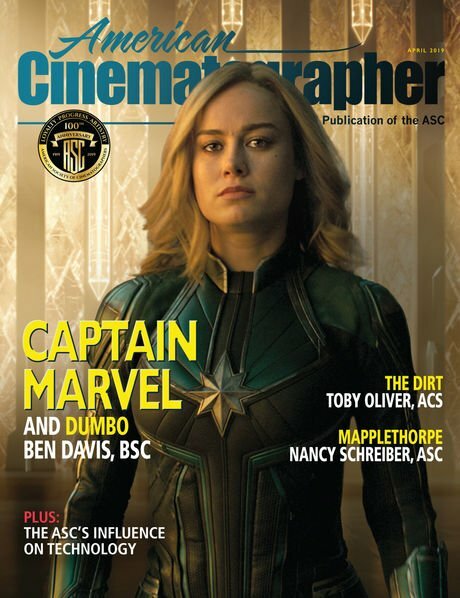 Click on this image to purchase a complete digital reprint of this rare issue. 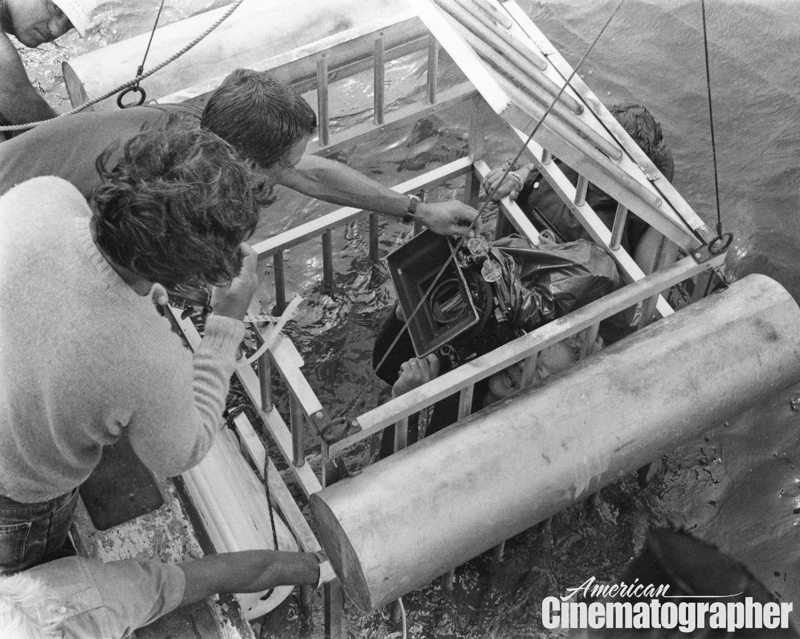 With the new Great White shark terror tale The Shallows recently in theaters, we were inspired to dig into the American Cinematographer archives for this collection of images from the suspense classic Jaws (1975), featuring cinematographer Bill Butler, ASC; director Steven Spielberg, operator (and future ASC great) Michael Chapman and, of course, Bruce, the frequently malfunctioning robot shark. 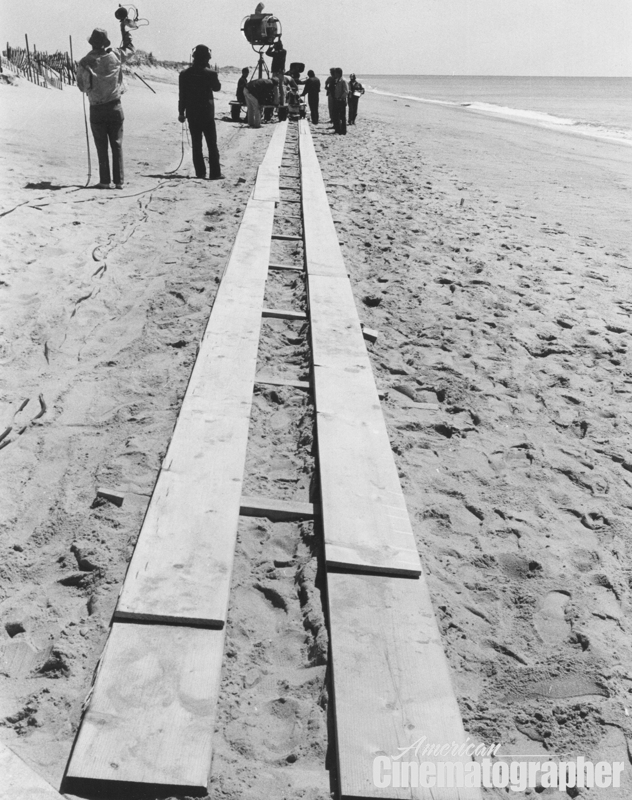 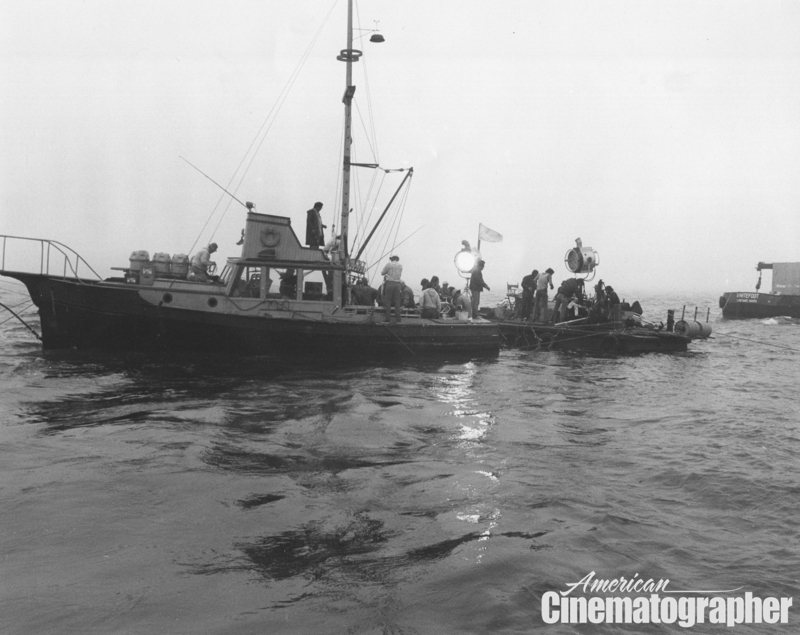 "Having no control over New England weather was a problem," Butler told AC while discussing the location filming in Martha's Vineyard. 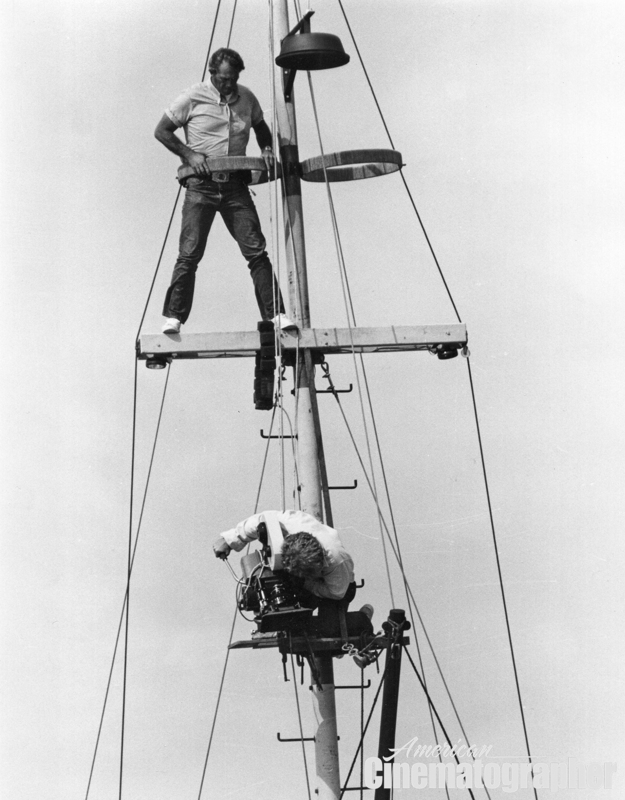 "But by careful choice of angle, I think we can make everything match. 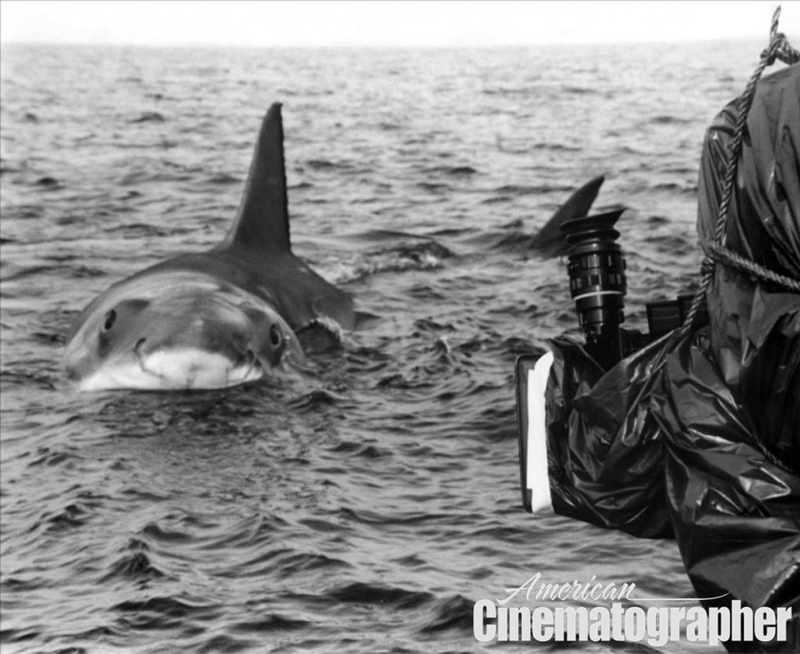 A big part of what I do don't have anything to do with shooting at all. 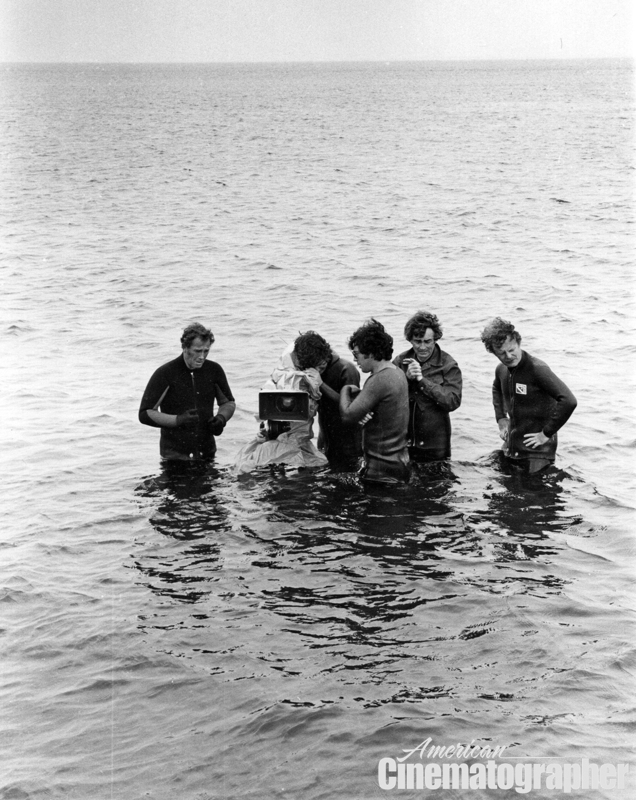 It has to do with handling people. 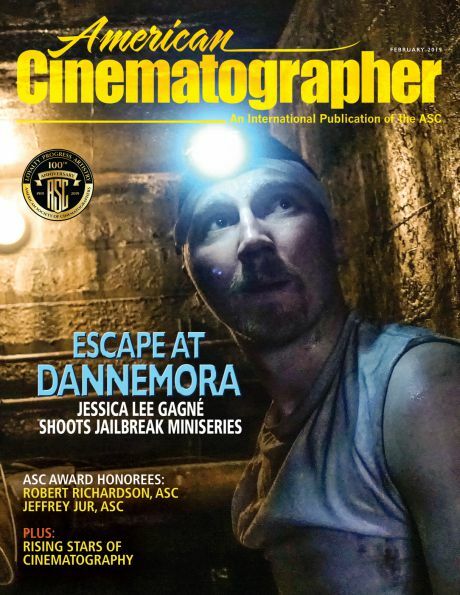 Knowing what gaffer or what grip is right to handle a certain problem." 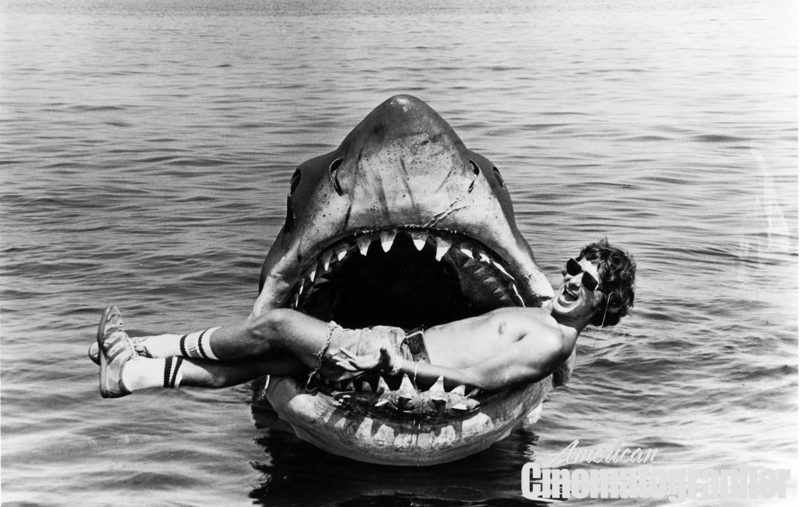 Discussing scenes shot aboard our shark-hunting heroes' boat, the Orca, Spielberg noted that Jaws was probably "the most expensive hand-held movie ever made." 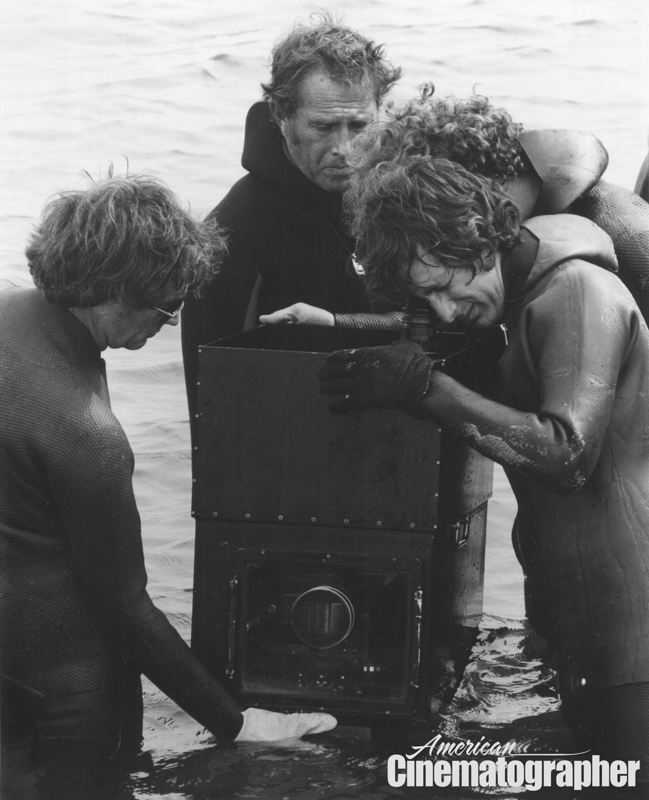 Because of the movement of the boat caused by the waves, Butler and Chapman found that they could get a steadier shot by hand-holding the Panaflex camera for many situations. 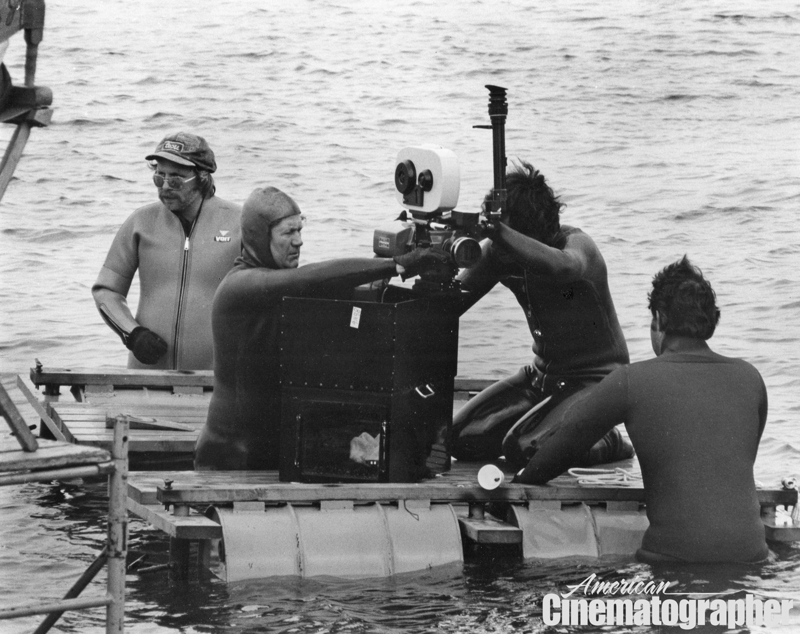 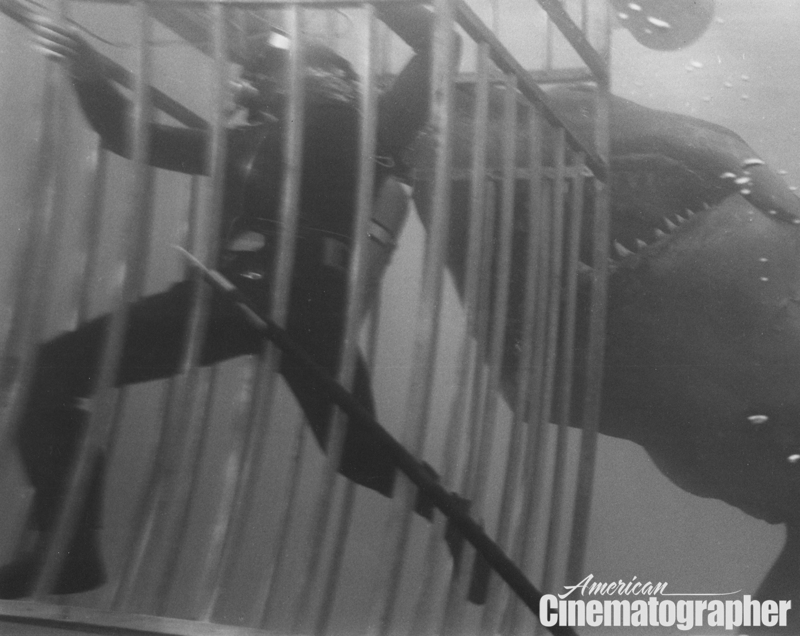 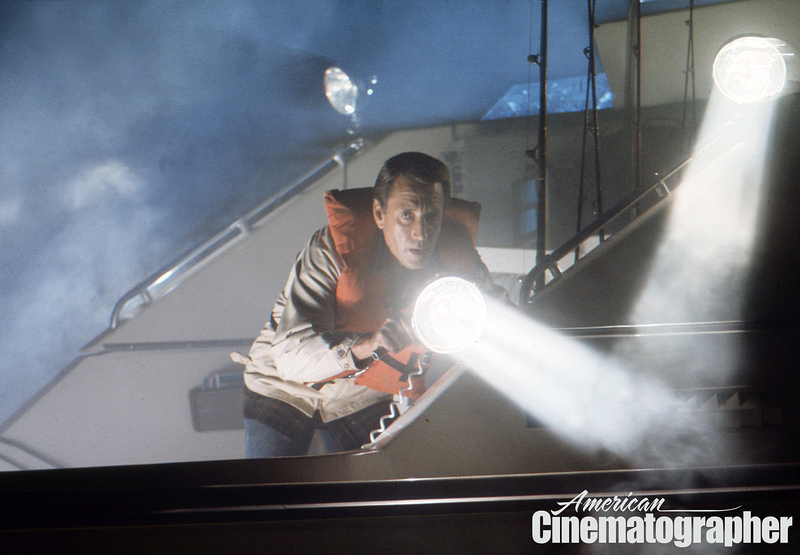 In open water filming the climactic scenes of Jaws aboard the Orca, which were filmed almost entirely handheld. 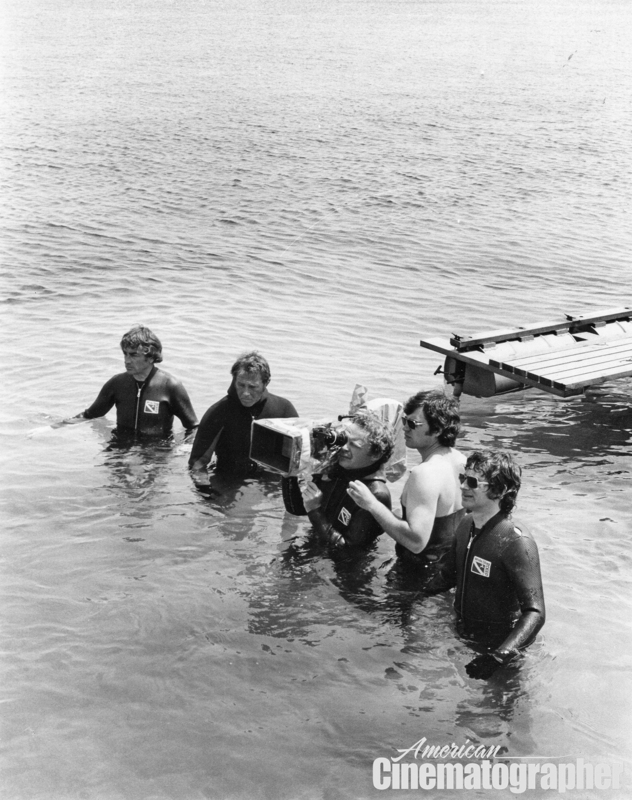 Asked about operating the Panaflex — which was still relatively new at the time, having been introduced in 1972 — Chapman said, "At first I was worried about the viewing system. 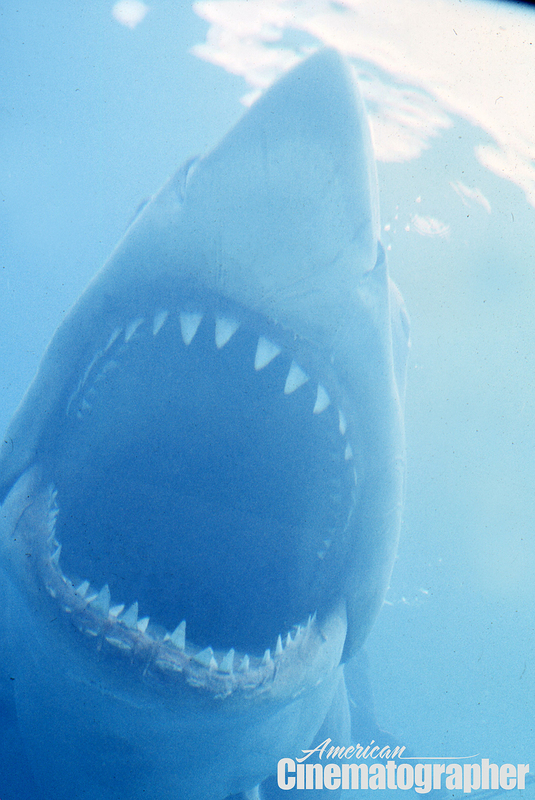 The eyepiece is up against the camera and it took me a while to get used to that. 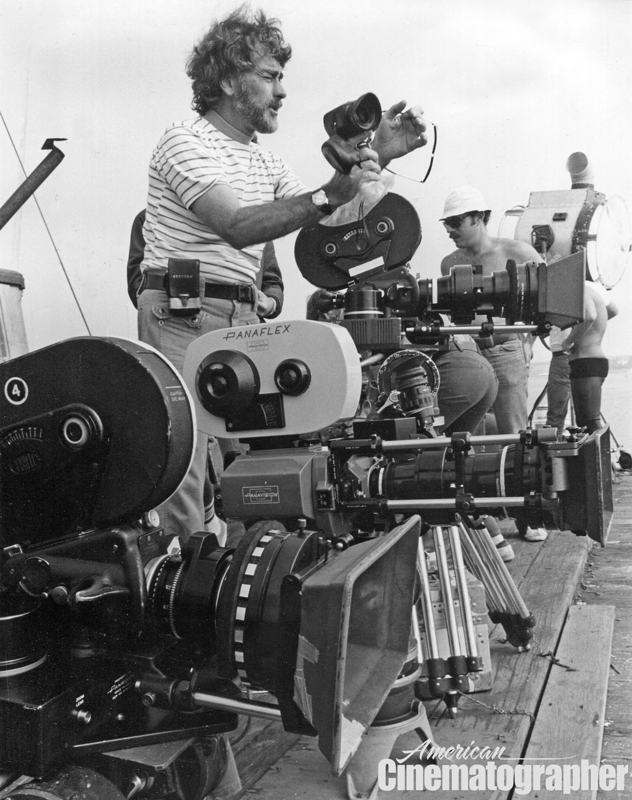 As a hand-held camera, it's pretty heavy — 34 pounds — but it's balanced very well. 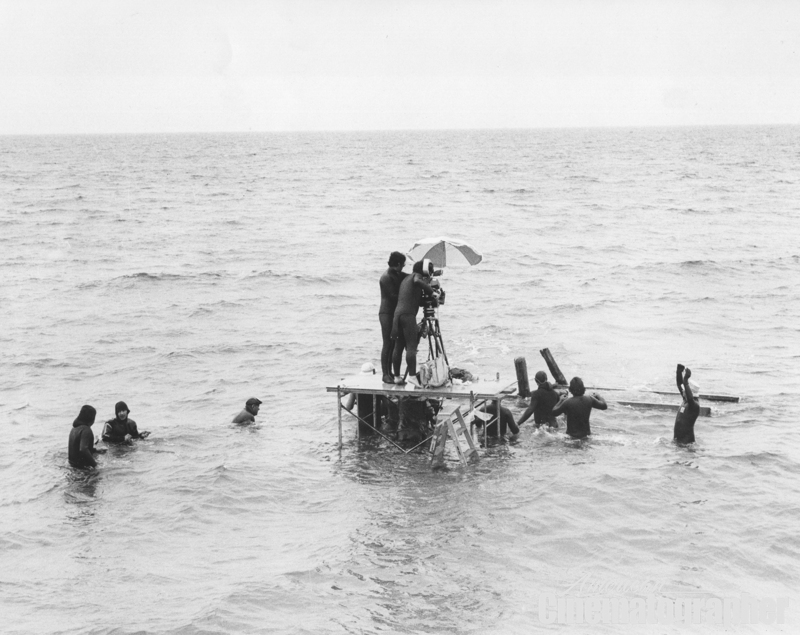 We really wouldn't have been able to do this picture without the Panaflex. 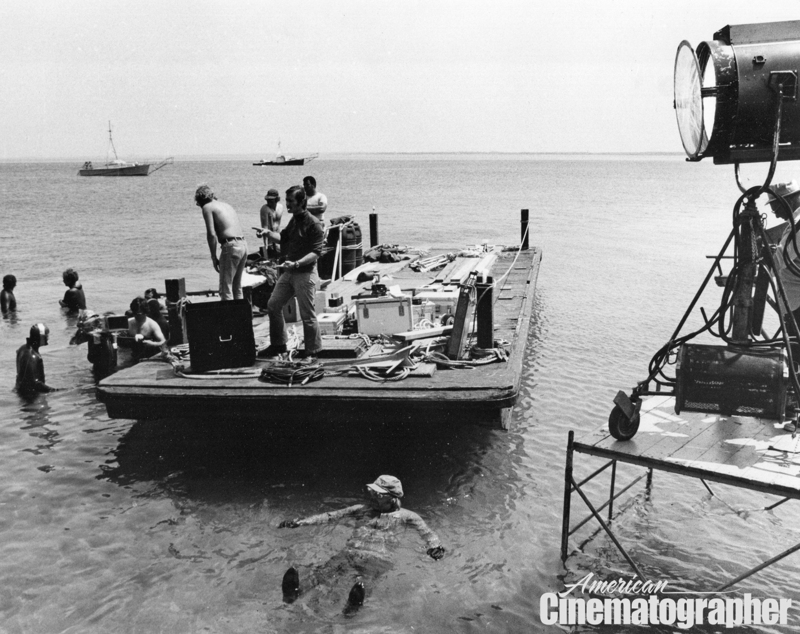 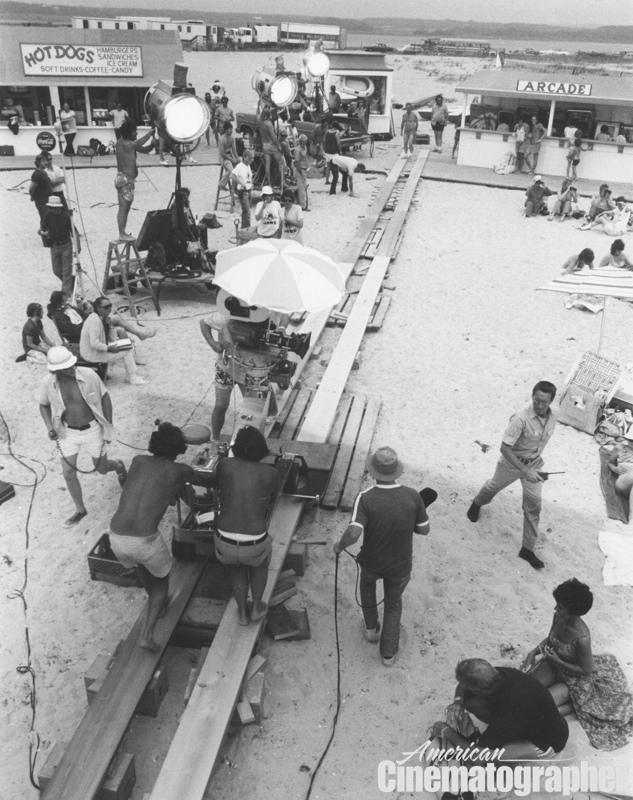 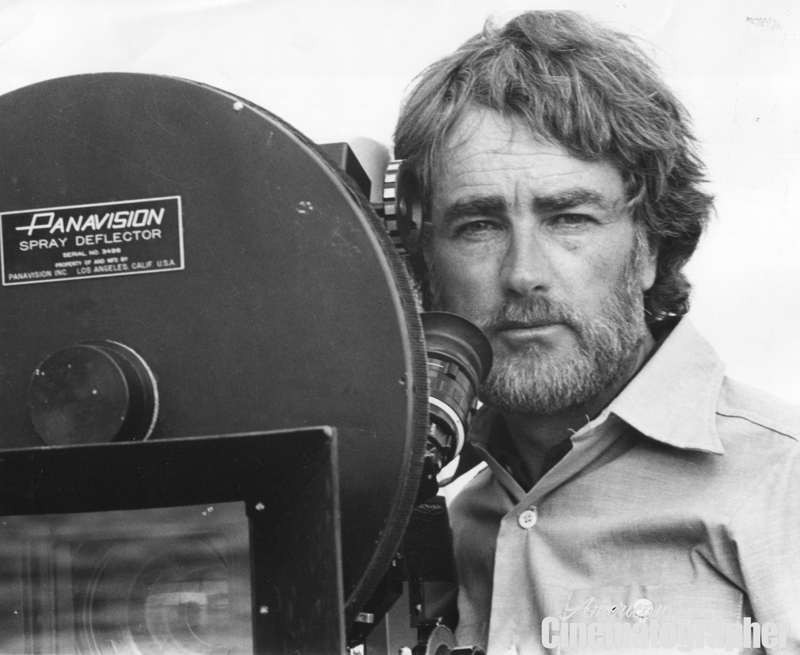 It's not as big as the PSR [Panavision Silent Reflex; a modified Mitchell, introduced in 1967] and we had to do sound shots where we couldn't bring the PSR, jumping from boat to boat eight or nine times a day." 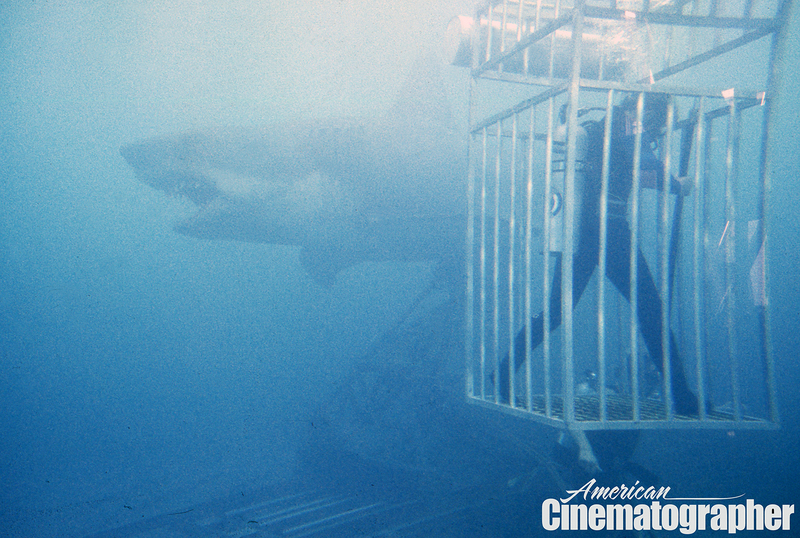 The following is a selection of images from AC's archive. 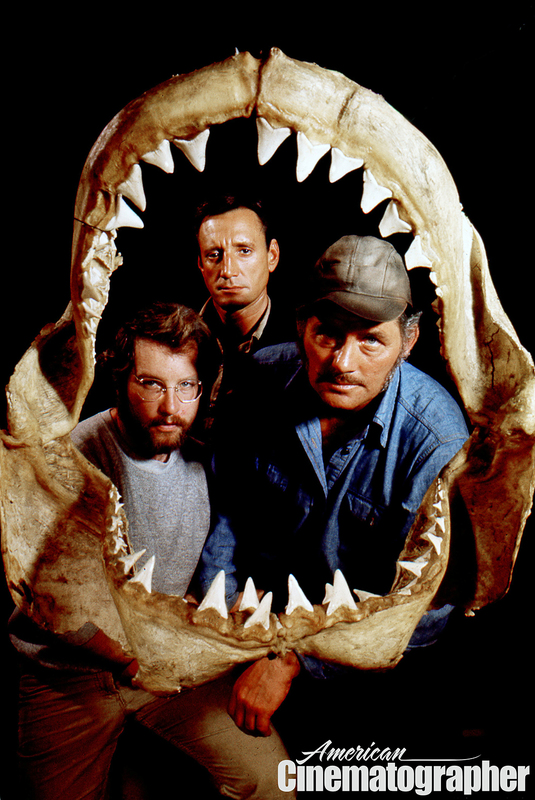 Richard Dreyfuss, Roy Scheider and Robert Shaw in a classic publicity image. 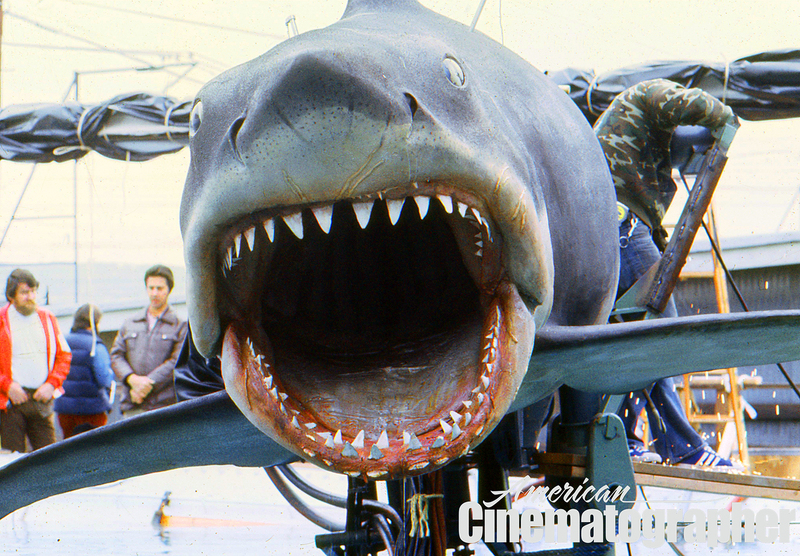 The frequently malfunctioning Bruce the shark. 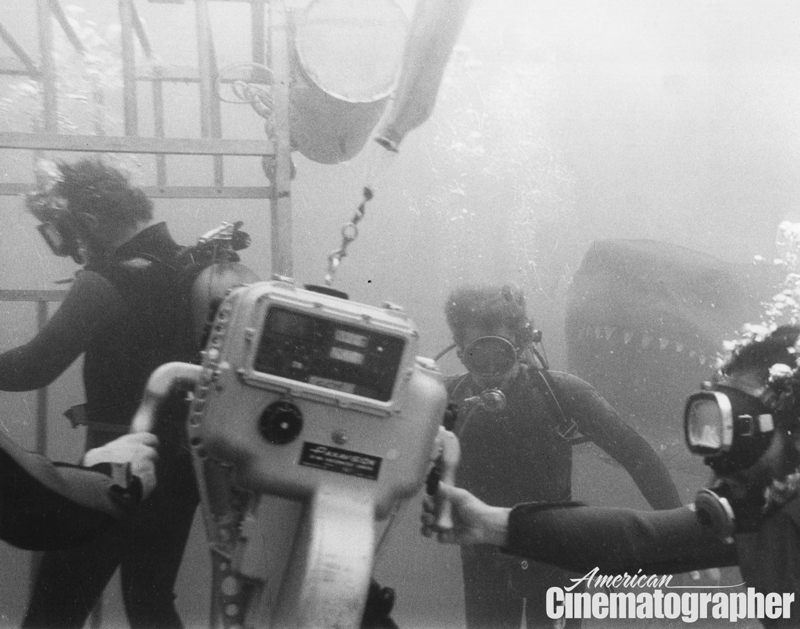 Spielberg checks the frame while shooting at surface level. 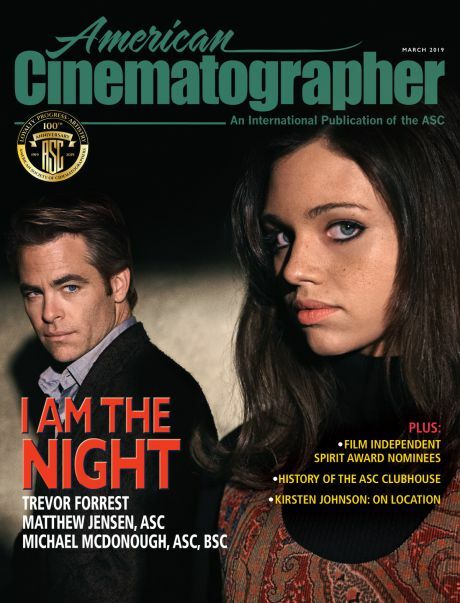 You can purchase a complete digital reprint of AC's March 1975 issue right here.